As Heaven’s messages continue to warn of an impending Asteroid Fragment collision threat to Earth , I feel that I should share very important information & “special sources” photographs at this time concerning the prior “breaking up of the Massive Asteroid by man in 2016” . Last year, as I was tracking the approach of the very Large Asteroid**, I kept certain information secret so as to not reveal “methods”, “deep space sources”, and “telescope data access” that I was using during this critical Earth Approach time period. By revealing too much on such sensitive and usually classified knowledge, this usually results in the loss of crucial “access” from sources wishing to “shut down” information that is deemed sensitive. Thus I would not have been able to provide detailed technical updates publicly (21+ update communications on the Asteroid status, events, & data) . I should note that I have not compromised any confidentiality or classification restrictions. Although extremely challenging, a scientist with particular skills and contacts has abilities to get answers in navigating the technological system. Through these “sources” of information, I was able to derive a wealth of information on what occurred, including coordinates, the nature of the original massive Asteroid, and the danger that Earth now faces in incoming fragment and/or fragments. The original trajectory of this massive Asteroid impact to Earth was accurate in the Sept 25, 2016 window IF the Asteroid was not intercepted and deflected . Precise measurements identified distinct changes in the Asteroid’s velocity and angle trajectory which occurred on specific dates. Given the large size of this original Asteroid, these velocity and angle changes could not occur naturally. Only a kinetic energy transfer to the Asteroid would cause such results, such as from thermonuclear detonations. These sharp shifts could only have been generated by Nuclear Bomb detonations on the surface of the Asteroid. The first series of detonations were lower yield devices as was revealed by the resulting Asteroid’s velocity and trajectory shifts. However, the last two nuclear detonations were very powerful and caused a significant velocity and trajectory shift compared to the prior detonations. The first high yield detonation resulted in an “agency” decision to “shut down” or “censor” the telescope data output results from a number of space telescope satellites. The second and last high yield detonation residual was captured on multiple different space telescope satellites. The immense nuclear radiation from this blast was observed as wide field ionizing and “blooming” effects in the deep space telescope sensitive camera imaging detectors. Both of these two events precisely matched with the significant trajectory and velocity vector changes of the Asteroid. Amateur Astronomers and Large Earth telescope facilities would not “see” these events as the Asteroid had a “sun approach”. A daylight approach Asteroid which is not far from the sun is only detectable using deep space telescopes looking away from the sun. 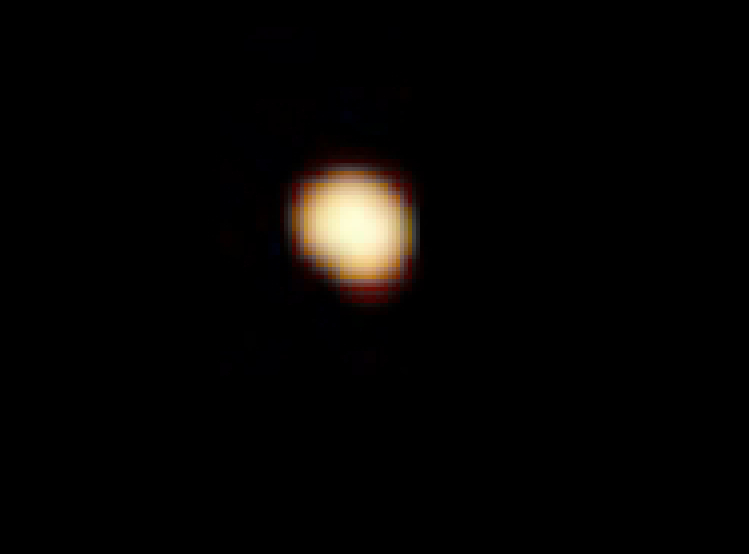 This is why many Amateur Astronomers could not confirm the reports on this object. This is the same reason why NASA & scientists did not detect the Russia Chelyabinsk meteor . The other unique and unusual factor to this Asteroid was its close match to the orbit of the Earth around the Sun. This means the velocity of the Asteroid was slightly faster in an intercept with the Earth with an approach angle coming from the sun. This “slow” arc second movement, relative to Earth, makes the object look like a nearly stationary star when viewed from a terrestrial telescope. Only after the series of nuclear bomb detonations, which successfully deflected the Asteroid , did the Asteroid eventually progress to the nighttime sky. Extracting, calculating, and thus knowing the Asteroid’s new coordinates, enabled being able to track and capture a photograph of the Asteroid from a selected observation source located in the Earth’s southern hemisphere. It was discovered that the Asteroid is pock marked with glassified reflective surfaces where the nuclear blasts occurred. A rare and bright momentary “reflection” from one of these blast craters was captured as the Asteroid rotated to a Sun-Earth reflection angle (see Photo 1). The curvature shape of the reflection in the photograph is consistent with a reflective crater-like concave surface given the known Sun-Earth-Asteroid positioning at the date/time of the capture. The reflective color of the light is consistent with the sun’s spectra which evidences a near pure reflection from a smooth surface. No naturally formed Asteroid in space has been observed to have such a reflective shape or surface. Only a thermonuclear detonation has the ability to transform such a surface condition of an Asteroid (i.e. glassified metallic rock from an intense thermonuclear explosion). Photo 1. This photograph reveals one of the “glassified reflective crater” surfaces on the original Large Asteroid formed from multiple nuclear blasts. The zoom of this photograph denotes a curvature nature “shape” which would be consistent with the Sun-Earth-Asteroid angle to a concave formed reflective crater. The slow arc second movement of the Asteroid and the blast fragments with respect to the Earth is how these objects remain hidden. Stacks of individual telescope image photographs are typically used to detect a straight line “blur” against the background pattern of stars. However, a slow moving rate of a differential between the Earth and the Asteroid results in these “stacks” looking nearly indistinguishable from stars rendering the Asteroid undetectable from Earth telescopes using this standard method. Only knowing the exact coordinates and using a very long time elapsed photo “stack” is the Asteroid discernible. The second danger to being “blind to the incoming detonation fragments” comes from these fragments originating in space from the daylight side or sunlit side of the Earth. The gravitational pull of the Earth, on a large detonation created fragment or fragments, could follow an initial high parabolic trajectory, and then entering into a slow gravitational pull descent***, that is relatively slow moving in terms of a typical Asteroid to Earth relative motion. Only with high resolution deep space radar systems would these fragments be detectable on the daylight or sunlit side of the Earth. Captured Photograph 2 shows a Dangerous Asteroid “detonation created” fragment that missed the Earth back in late fall in 2016 (note: color enhanced to reveal the blue/violet clouds – reddish hue of fragment is darker in the original image capture). 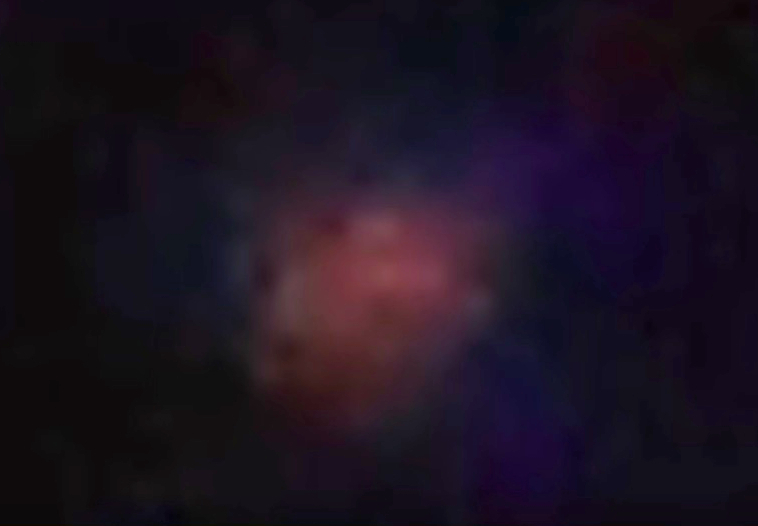 The zoom of this photograph reveals reddish coloring that is known in the scientific community to be associated with the most dangerous type of M-Type, or metallic type, Asteroid . M-Type Asteroids are high in metallic density composed of a mainly Iron-Nickel content. These Asteroids penetrate with the least amount of ablation losses from atmospheric frictional heating when entering the Earth’s atmosphere. Because of this, they present the greatest danger in their atmospheric survivability and kinetic energy impact potential to the Earth. Another revealing characteristic to this fragment photograph is the strong illumination of the blue and violet colored gas “dust clouds” around the object. These clouds represent the fine particulate matter that is ablating from the fragment. As the fragment was exposed to a massive thermonuclear detonation, there would be a residual and intense radioactive fallout of material intermixed with the composition of the Asteroid fragment. Absorption and re-radiation of radioactive particles by compounds are known to re-radiate in a light emission spectra. Nickel, when exposed to extreme temperatures, also has been known to reflect a slight blue spectra. However, the unusual intensity of this blue and violet illumination color, in a unique area of the outward debris cloud, would greater evidence an interaction from an intense radioactive fallout stimulation, absorption, and re-emission process. How does an Asteroid Fragment “emit” dust? Since there’s no atmosphere in the vacuum of space there’s no typical force that could eject a cloud of fine “debris like” dust from an Asteroid. A Comet experiences solar heating where the sun’s rays induce an outgassing of fine “cloud like” debris from the frozen surface. This creates the visible “tail” of a comet resulting from the illumination of this fine debris from the sun’s light. Yet, this large M-Type metallic composition Asteroid Fragment has clear “cloud like” streams emanating from many sides. There are only two mechanisms at play to induce this effect. The first is the exothermic reaction in heat absorption from a powerful nuclear detonation. The dense metallic body of the Asteroid Fragment would have retained a level of heat from the thermonuclear detonation that fractured this piece from the main body asteroid. The second mechanism is from an intense radioactive presence of material on the surface area of this fragment from the thermonuclear blast. Both of these effects transfer energy to release small particulates that were created when the fragment was broken off and ejected from a detonation. A Repeat of Nuking an incoming Large Fragment? The evidence is overwhelming that multiple nuclear detonations were engaged on a very large Asteroid a good distance away from Earth in 2016. It’s very possible that a repeat of this process will occur again if a large fragment is pulled into the gravitational well of the Earth . The most difficult detection of an incoming fragment would be from the sunlit direction of the Earth. Thus the fragment would be fractured into multiple pieces while creating a huge dust particulate cloud. The sun’s illumination of this nuclear blast induced dust particulate cloud would be so bright that it would be seen by observers on the Earth as an irregular shaped and bright second sun like object in the sky. This brilliant illumination was witnessed by a technical contact that I had personally interviewed in the original detonation and Asteroid tracking series. There is a narrow refraction angle of the sun that reveals this massive dust cloud in a very bright illumination – stated by the source “as near as bright as the sun” (like an irregular “bright star”). This would match Heaven’s messages of warning of just over 3 hours, once the “bright star” is seen, to get to high ground (along the Eastern Seaboard of the U.S., Florida, New York, Puerto Rico, the Caribbean, et al) to avoid Heaven’s stated message of a 100 meter tall tsunami . God’s children must be made aware of this kept photographic evidence* as this is important for mankind to respond to Heaven’s messages. Time may be short. **Note: Size of original Asteroid, now deflected from Earth, using deep space IR images (analysis from hundreds of images) -> greater than 100km – 500km in size (conservatively). ***Slow initial descent due to the series of detonations occurring near the Sun/Earth Lagrangian gravitational balance point. LITTLE PEBBLE: The world is in great danger. You will be able to see this Asteroid visible with your eyes. This will then give you 3 1/2 hours to move away from the regions that will be affected.